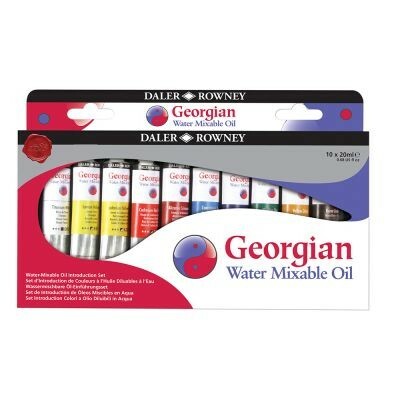 This introduction set of Georgian Water Mixable Oil Colours contains 10 x 20ml tubes of student quality oil colour. Georgian Water Mixable Oil Colours offer great value for money and the chance to experience oil painting without the need for any potentially hazardous chemicals. An alternative to traditional oils, the balanced range of colours can be thinned, mixed and washed using water and as such is ideal for use indoors and in a classroom environment. Every colour in this range has high lightfastness, great pigments load and good durability. As their texture and viscosity is similar to that of a traditional oil colour they can be used for most of the same techniques - use thick for impasto technique or thin with water or thinner to create watercolour-like washes.